Justin Sullivan/GettyYou can still make bank at Citi. 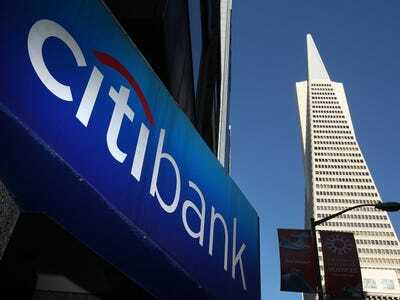 The name “Citibank” calls up a lot of bad memories in the financial world. One that stands out is Chuck Prince, Citi’s former head, telling the Financial Times in the summer of 2007 that the emerging financial crisis wasn’t going to upset his bank’s business. Citi promptly faced $US45 billion in writedowns and a long saga of bailouts, prompting a spin out of a holdings company with especially terrible assets. Though Citi is cutting jobs and pulling out of markets, the name still earns respect. We pay attention to its recommendations of stocks to pick and technologies that will change the world. Landing a job there could change your life — since, like with Goldman Sachs, JPMorgan Chase, or Morgan Stanley, the ceiling for compensation is sky high. According to the self-reported salaries and bonuses listed on Glassdoor, the job reviewing site, you can pull in over $US750,000 if you make it up to executive director. As is the case with other financial institutions, investment banking positions at Citi see their compensation numbers swell with bonuses. The base salary for an investment banking associate, for example, stands at an average of $US116,984. It nearly doubles after bonuses, vaulting to $US210,869. Compare that with Goldman, JPMorgan, or Morgan Stanley.